Courtesy photo Northwest District II Runner-up: The Galion Tigers Pictured (from L to R): Head coach Bryce Lehman, Matthew McMullen, Matt Kingseed, Spencer Keller, Mitch Dyer, Jack McElligott and Kaleb Harsh. FINDLAY — The weather was not ideal on Thursday but that did not stop the Galion Tigers golf team from continuing to write their story. The Galion linksters were at the Red Hawk Run Golf Course in Findlay to compete in the Northwest District II district tournament. Once the final putt was made, the Tigers found themselves headed to the state tournament after finishing as the runner-up on the day, shooting a team score of 338. Archbold was crowned the district champion, recording a combined score of 321. In the district format, the top two teams earn an automatic state berth and the top-two finishers not on a qualifying team also advance. Brett Montgomery, a sophomore from Upper Sandusky, was the medalist on the day, shooting a 72 to advance. Jack Grombaucher, a senior from Toledo Central Catholic, shot a 77 on the day to move on as well. Other team scores on the day were: 3. Genoa- 345; 4. Toledo Central Catholic- 347; 5. Bath- 355; 6. Ontario- 356; 7. Vermilion- 363; 8. Kenton- 369 and 9. Huron- 394. Junior Jack McElligott fired the lowest score on the day for Galion, shooting a front nine 41 and a back nine 39 for an overall score of 80. McElligott tied for seventh overall in the field. The freshmen duo of Spencer Keller and Matthew McMullen also placed within the top-15 individually on the day at Red Hawk Run. Keller turned in a front 41 and back 41 for an overall round of 82, good for 12th and McMullen shot a 43 and a 40 to record an 83 and place 15th. Mitch Dyer finished the day with a 93 for the Tigers and Matt Kingseed turned in a 106. 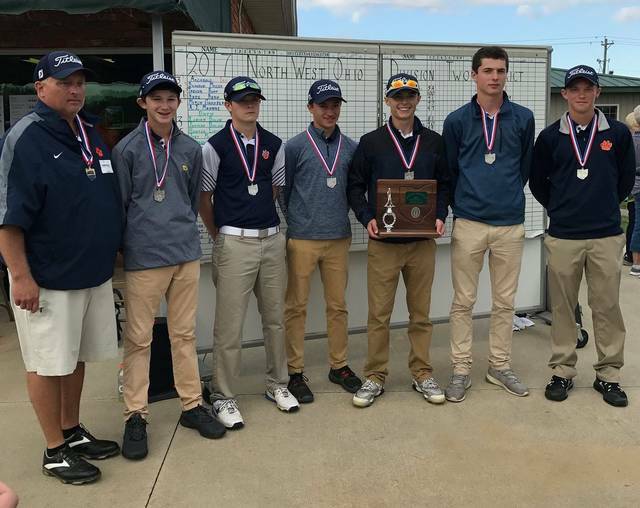 Galion will now take part in the state golf tournament at the NorthStar Golf Club in Sunbury. The first stroke of the tourney will begin at 9 am on Friday, October 13 on the tenth tee. Action starts with the number five player, Matt Kingseed, followed by the rest of the Tigers squad. https://www.galioninquirer.com/wp-content/uploads/sites/38/2017/10/web1_Another-team-placement-photo.jpgCourtesy photo Northwest District II Runner-up: The Galion Tigers Pictured (from L to R): Head coach Bryce Lehman, Matthew McMullen, Matt Kingseed, Spencer Keller, Mitch Dyer, Jack McElligott and Kaleb Harsh.